The Elmo CO-10 Document Camera with CRP-22 Projector is a 1/4" CMOS sensor, image capturing device with a resolution of 600(H)TVL and a 6x optical zoom. It comes with a CRP-22 that allows you to project high-quality images on to the display screen. 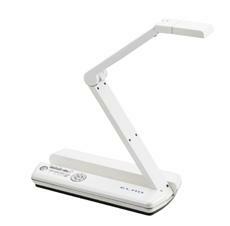 Being foldable, lightweight (2.9 lb / 1.32 kg), and compact (5.62 x 17.55 x 13.31" / 14.3 x 44.6 x 33.8 cm), the CO-10 Document Camera is portable and ideal for classroom presentations. In addition to a flexible camera arm for positioning the camera in any angle, it also has a microscope-view mode for enlarging minute objects up to 51x zoom. To use the camera, you need to place materials under the camera and connect it to a projector. Using the Image Mate software, you can control camera functions, import or transfer images via a PC. Up to 16 images can be stored in the memory for a quick review during presentations.